The lack of legal recognition for lesbian, gay, bisexual and transgender (LGBT) families harms children and threatens their ability to thrive. Children may go without health insurance or a parent may be limited in making healthcare decisions for them. Children in foster care are denied permanent homes, even when there are qualified, loving LGBT families ready, able and waiting to adopt. Children may be wrested away from the only parents they know when relationships dissolve or a parent dies or becomes disabled. And they may be unable to access financial lifelines and safety net programs designed to support families during family crisis. 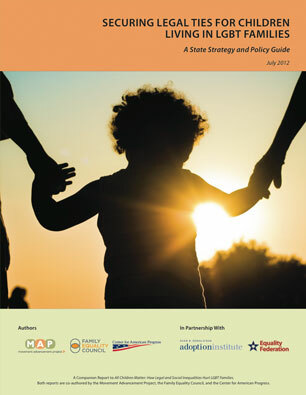 Securing Legal Ties for Children Living in LGBT Families: A State Strategy and Policy Guide examines the outdated state laws—particularly in the areas of marriage and parenting—that largely ignore and routinely harm the roughly two million children being raised by LGBT parents. It provides an overview of the diversity and demographics of LGBT families, looks at how the paths to parenthood for LGBT parents intersect with archaic laws and practices that often leave children without legal ties to both their parents, and explores the ways in which that lack of legal ties hurts children being raised in LGBT families. In addition, Securing Legal Ties for Children Living in LGBT Families (which expands on the content from All Children Matter: How Legal and Social Inequalities Hurt LGBT Families) offers a detailed framework for state policymakers to draft, pass and enact new laws that protect all children--including those living in LGBT families and other contemporary family structures--and recommendations for amending, repealing or overturning discriminatory laws that leave children without the security of legal ties to their parents. Movement Advancement Project, Family Equality Council, and the Center for American Progress. July 2012. Securing Legal Ties for Children Living in LGBT Families: A State Strategy and Policy Guide. http://www.lgbtmap.org/securing-legal-ties (date of access).